Well as you'll guess, not too much has been happening in the past little while that has been worth a mention. In fact, my lack of blogging has been wholly necessary to get across just how quite the western front has been. Tumble-weed and lonesome hobos with busted walking canes. Obviously the weather has been a tad bit rude, as it is this time of year. Hot and sweaty and sweaty and hot making any thought of justifiably climbing outdoors those of a true tripper. Oceans of rain have been pummelling the Mountains for the past 4 months and combined with the summer heat has made for a climate not unlike being blanketed in rotting meat. Festery and wretched. But all this weather, despite what you may think can have its up sides. Assuming one has access to some kind of trainingland, good time can be spent in the wet heat training for the time the clouds break and that god giving wind comes a' whistling up the pass. Training tales just don't make for the most exiting blogs though... But training has been happening on all fronts and by all folk. 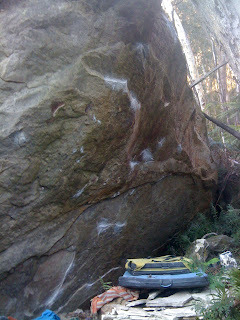 I myself have been feasting on a diet rich in fingerboarding and campusing with interval training on pockety boulders. This has been really ace and I have found i've been able to get some awesome gains focusing on ultra-fingery stuff and throwing any kind of hope for climbing outdoors out the window. I'm not really fussed if I ever get outdoors again. With this turn in weather though, despite what you might think from the above passages, I have ventured out on occasion. Recently I headed down to that unspoken of land 'neath the sun drenched peaks of Blackheath, where shadows stretch long and grim with all manner of evil lurking at every bend - The Ukelore Valley. I thought the weather had decided to get ship-shape before it actually had so I roled on down into that god-aweful place with a total of four boulder mats in toe with plans to try the killer line on the underside of the 'Ukelore' boulder. It was actually really awesome, the weather wasn't ace but it didn't really matter, I hadn't actually given this thing any real curry so I was super psyched just to have a casual tussle. From previous post you'll be well aware that this is the single best thing on the planet. The rock is like a cross between Font and Taipan, the moves are like 1-7 pounces on fairly positive edges and the landing is perfect...now. The one thing is that you have to brave the terrors of the underworld and the toildom that they must suffer midst those rotting leaves. But other than that it's heaven down there. I've also had the odd tussle on my project at Boronia Point. the mega line starting up Big Wednesday and finishing up Tripe. It tackles the roof between the two routes via some outrageous pounces, hugs, 360's... the whole bit. It is what I'm most psyched on for this year, that and das Frankenjura that is. I think it should be a pretty hard route too which is rad. The only thing I have that I can compare it to of that difficulty, that I've spent a bit of time on is Action Directe and I think it is a good half grade.5 harder than that, which is also cool. Mid January saw Lee and I escape to the Tyndalls in Tassie to see if we couldn't bolt a cool new route up the guts of a rad barrely feature shown unto us by the perennial froth bag Garry Phillips. We drove on down on a horrendously humid night. Raining and 28 degrees, my car doesn't have AC so windows up in the swelter box for 12 hours of suffrage to the Spirit of Tasmania. Once there we bivied in the rain till the next morning. We took an oath that no matter how bad it got we'd not pay for accommodation the whole time we were there. We managed to pull it off but we did have to endure some sleepless nights with Devonport bogans doing sick doeies in the car parks we were sleeping in and garbage truck men making indecent proposals in the dead of night. Lee almost got pecked to death by Fairy Penguins too but he drop kicked them all to South Georgia. Every morning for that godforsaken trip we were greeted with the thickest most cling-wetty fog I've ever had to endure in all my long days. In total we spent 6 days up there in the camp cave, watching the rain turn into snow turn into hail and blow into our cave. We were drenched and freezing the whole time, but our hope for the next days fine weather never dwindled. Bolting wise....bolting wise we got two dynabolts in the top of our route, Lee was the only one to put a harness on and he only spent about 2 dry minutes in it. After he'd rapped off it began to hail (again). The only thing we managed to do with the time up there was get some hammed-up Wild cover shots of me looking as boring as possible in my technical outer garments. In all though it was fun, we saw a stuffed Fairy Penguin, most likely the highlight of the trip, Lee drop kicked it to South Georgia, we slept under lighthouses and managed to kill two days straight within the bastion of boganinity - Devonport. You wonder where people from Lithgow and Wallerawang come from, all their ancestors come from Devonport as it turns out, there and some pretty funky petri dish experiments.